↑ Jean-Noël Biraben (1980), "An Essay Concerning Mankind's Evolution". Population, Selected Papers. Vol. 4. pp. 1–13. Original paper in French: (b) Jean-Noël Biraben (1979). "Essai sur l'évolution du nombre des hommes". Population. Vol. 34 (no. 1). pp. 13–25. 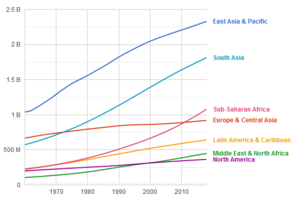 ↑ "World population stabilization unlikely this century" (September 14, 2014). Science 346 (6206): 234–7. AAAS. doi:10.1126/science.1257469. ISSN 1095-9203. PMID 25301627. PMC:4230924. Retrieved on September 21, 2014. ↑ World Population Prospects: The 2015 Revision။ UN Population Division။ Archived from the original on December 22, 2015။. Linked to at Download Files, where it states that the figures are for July 1 of the given year.